We can provide you with route cards and maps upon request. Please contact us, if you have further questions about any of the walks. You can mix and match both routes. There is a half way pub in Catton (The Crown) serving delicious food with an enclosed beergarden and cosy wintergarden, real fire and real ales. 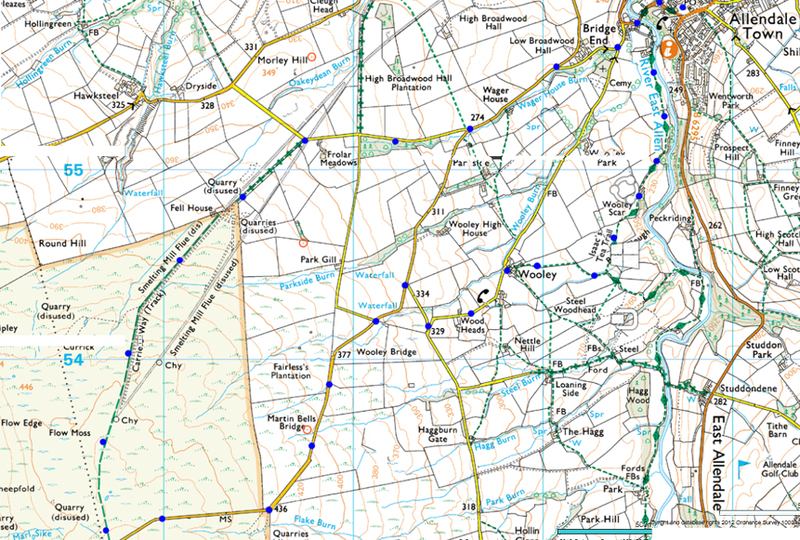 Blue dots: this walk is approximately 9km long, which can take some people a couple of hours and others all day – please be careful to pack enough provisions, as the weather can change quickly and you wont always have a mobile phone signal. There is also no pub or shop on route. 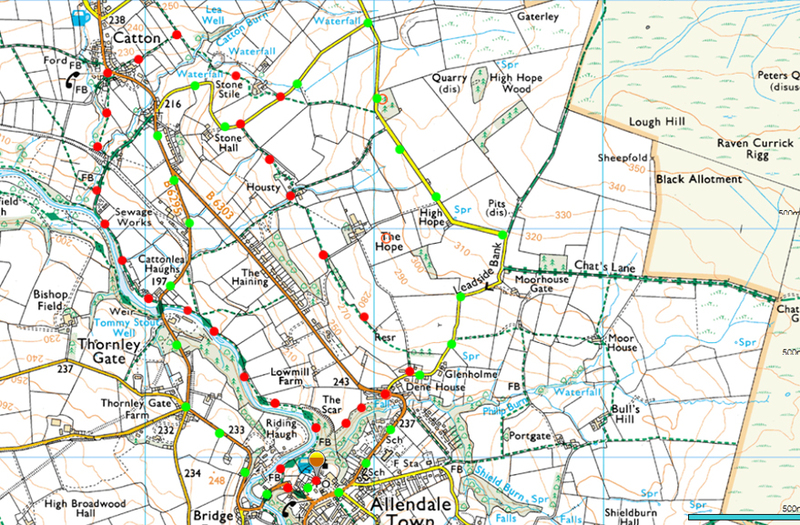 Again there are various variations of this route, but whichever way you go, the famous Allendale Chimneys (marked “Chy” on the map below) are well worth a visit. Again, the Allendale Chimney Walk is a popular day walk, if you want to take it easy, take a picnic and explore. You can walk across the fells and moors all the way to Hexham and either take the bus back, or we can come and collect you. Another great day walk is all the way along the River Allen – indeed heading NORTH past Oakpool and into Staward Peel all the way to Plankey Mill, or SOUTH past Sparty Lea and into Allenheads, with its fabulous cafe, playground and pub. The number one day trip is to Hadrian’s Wall, walking along its ancient remains and enjoying views into Scotland as well as over Northumberland. Another popular day trip is to Ashgill near Garaghyll to stand behind gigantic waterfalls, enjoy a paddle in one of the deep, cool pools and water down to the river confluenece and further into the village of Garagill. You can also do sections of one of the 7 (!) Long Distance Walking Trails that pass right through Allendale, please see the next section for further information. 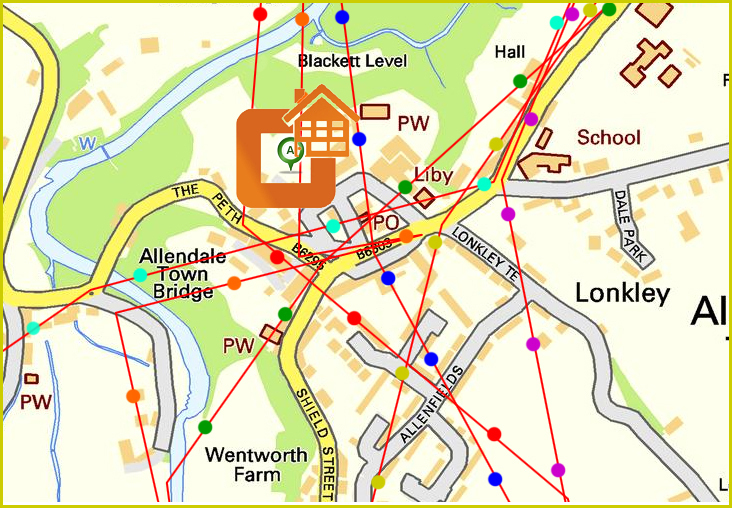 There are 7 nationally and some internationally known Long Distance Walks passing right by the Allendale Bunkhouse. You can choose the bunkhouse just as a perfect one night stop over (self catering with a coop shop on your doorstep, catered or eat out at one of 4 pubs and restaurants in walking distance) OR we can pick you up in our minibus after each leg of your walk and this way you can keep all your luggage in one place by spending every night in the Bunkhouse. (red) Reiver’s Way, 242km / 150miles: A meandering route recently updated by Paddy Dillon, across Northumberland in the footsteps of the notorious border reivers, starting in the Tyne Valley passing the finest remains of Hadrian’s Wall, and then heading northwest to Rothbury, over the Cheviots to Wooler, and finishing with the coast path from Budle Bay to Alnmouth. Reivers were raiders along the Anglo-Scottish Border country between the 13th and 16th centuries, with their heyday in the last hundred years during the Tudor dynasty in England. (orange) Isaac’s Tea Trail, 58 km / 36 miles: A tough 36 mile circuit over the North Pennines with over 4500ft of ascent, visiting Allendale Town, River East Allen, Carrshield Moor, Nenthead, River Nent, Alston, Blagill, River South Tyne and returning via Ouston Fell. Named after a character of yesteryear, this route starts at Isaac’s Well in Allendale and passes a number of Methodist Chapels and other places associated with the Holden family, Isaac having worked as a traveling tea seller and money raiser. (light blue) Alternative Coast to Coast, 320 km / 199 miles: The ACC begins on one island and finishes on another. It starts on the west coast at the Beachcomber Cafe on Walney Island near Barrow-in-Furness. After crossing the Irish Sea, the walk skirts the edge of Barrow, into the Lake District. Several Lakeland peaks are climbed, delightful Lakeland villages are visited and the full length of Ullswater is walked. Between Penrith and Hexham, the route crosses the Northern Pennines. Hadrian’s Wall is then negotiated before crossing Northumberland with its Cheviot Hills and wilderness areas. The ACC finishes in a grand style by crossing the North Sea and finally arrives at ancient Holy Island. (dark blue) Great English Walk, 938 km / 583 miles: A journey across England from south-east Wales to north-east England. The route takes in the Forest of Dean, Wenlock Edge, the Cheshire Plain, the Peak District, the lesser used parts of the Yorkshire Dales, Allendale and the Northumbrian towns of Rothbury and Wooler. (yellow) Lakeland to Lindisfarne, 320 km / 199 miles: A long distance walk as an alternative to Wainwright’s route, between Ravenglass (Cumbria) and Holy Island (off the Northumberland Coast). (purple) Lake to Lake Walk, 267 km / 166 miles: From Lakeland the route takes a line through Appleby and Brough to the Pennines then strikes north through Middleton in Teesdale, Allenheads, Allendale and Bellingham, crossing Hadrian’s Wall near to Chesters Fort. In effect, the route links Lake Windermere with Kielder Water. (green) Tops of the North, 713 km / 443 miles: This is the second and final leg of Graham Wilson’s 1,000-km high level walk linking County Tops of northern England. From Carlisle to The Cheviot and the Northumberland coast, from the Durham moors to the Yorkshire Dales and the Peak District, his entertainingly roundabout route finally returns to the moorland near Buxton where it began. The diverse tour takes in Hadrian’s Wall and Northumbrian castles.